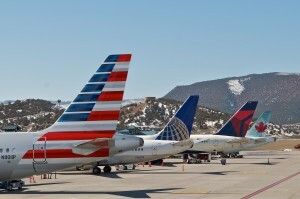 Mike Brown, chairman of the EGE Air Alliance, announced Friday that the organization secured new winter service on American Airlines from Phoenix (PHX) to the Eagle County Regional Airport (EGE) seven days a week. The EGE Air Alliance announced the addition of a new American Airlines flight between Eagle and Phoenix next winter (EGE photo). The non-stop flight will operate daily from PHX to EGE beginning Thursday, Dec. 15; flights drop down to only Wednesday and Saturday on Jan. 9 and a Sunday flight gets added back on Feb. 19 through the end of the ski season on April 2, 2017. The northbound flight will depart PHX at approximately 1:15 p.m. with an arrival at EGE at 2:55 p.m. The flight to PHX will depart EGE at approximately 3:35 p.m. with an arrival at 5:15 p.m. The flight will make convenient connections to points across the southwest possible including San Diego, Orange County, Santa Barbara, Ontario and Long Beach. American will operate the new PHX service with 70-seat dual class CRJ 700s. Each flight will offer six first-class seats and Wi-Fi. PHX offers 307 daily flights that serve 81 destinations in 4 countries, including Canada, Mexico and Costa Rica. The EGE Air Alliance was able to secure this flight due to community support from more than 65 businesses; an historic level of support. The EGE Air Alliance is a 501c6 not-for-profit entity dedicated to creating a vibrant flight service program at the Eagle County Regional Airport. The EGE Air Alliance is a public-private partnership with participants including local municipalities and private business stakeholders. Book your trip now at at www.aa.com or visit www.flyvail.com for more information.